I recently got an email from Google HQ, advising me that security warnings would soon be appearing to visitors on my website, unless I "migrate to HTTPS." You probably know that a web address prefixed with HTTPS means that the content is encrypted before being delivered to your computer. That makes perfect sense on pages with forms that collect sensitive information like your name, address, password, credit card, or social security number. It's also important for webmail, online banking, and ecommerce sites. It's really not necessary for sites like this that don't require a login, don't sell products, and simply display information. But Google insists, so I obey. After twiddling the appropriate bits, and working out the kinks, all pages on AskBobRankin.com are now "secured" with HTTPS. 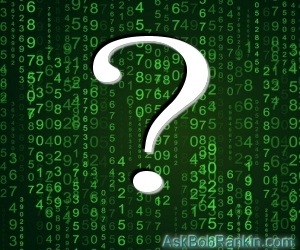 The glitch I encountered was that my email service provider wouldn't accept my article feed in HTTPS format, so no AskBob newsletters were delivered last Friday or this Tuesday. Somehow, it all adds up to music. A Japanese Youtuber who goes by the name "It's a small world" has figured out how to make melody with two Chinese AR7778 calculators. Listen to him play Smash Mouth's "All Star" and several other songs on these makeshift keyboards. A Facebook Messenger spam campaign is spreading links to malicious Chrome extensions that install themselves. Read about the spam’s characteristics, and don’t trust any shortened links to videos even if they seem to come from friends. If Windows Update is giving you headaches, try this Windows Update Troubleshooter from Microsoft. It diagnoses and fixes problems automatically. Read about life on an Inner Mongolia Bitcoin farm, and think about how we can retrain Appalachian coal miners. Scores of people are out hundreds of dollars apiece after startup Kanoa went broke without delivering a single set of high-tech earphones. Another reminder that crowdfunding is gambling, not purchasing. Facebook is hitting “fake news” accounts in the pocketbook, denying them membership in Facebook’s ad network and revenue sharing. An estimated 465,000 patients with heart pacemakers made by Abbott Labs are being urged to see their doctors about critical software patches. You all know what happens when someone steals your heart, right? Microsoft’s Cortana and Amazon’s Alexa are becoming best friends. The two voice-activated assistants will call one another to perform more functions than one alone can. To test Amazon Web Services claim of “unlimited” storage, a Reddit user wrote a program that streamed adult content from a variety of Webcam services and uploaded 1.8 petabytes (1800 terabytes) to an AWS server. That’s about 23.4 years of viewing at 1080p. Beaston02 swears he’s not the reason Amazon cancelled its “unlimited” plan in June. California police cannot keep license plate data collected indiscriminately from millions of passing cars, and cannot deny the public access to such records, according to a California Supreme Court decision won by the ACLU and the Electronic Frontier Foundation. A microSD card that transfers data fast enough to run apps from it is welcome news, and it comes in capacities ranging from 16 GB up to a record-busting 400 GB. Thanks, SanDisk! Take a virtual reality tour of the inside of an active volcano’s cone. A new version of Google Photos for Android is out. It’s now capable of automatically caching any video you watched in order to allow you to replay it whenever you want without using additional mobile data. Most recent comments on "Geekly (and Security) Update - 07 Sep 2017"
I saw recently that Avast is collecting and selling user browsing data. Is this true and what other anti-virus programs might there be that DON't employ this. EDITOR'S NOTE: I saw nothing in that video about Avast. From all I've read, this talk of AV companies selling your browsing data is overblown. They may sell some data, but nothing that would personally identify you.